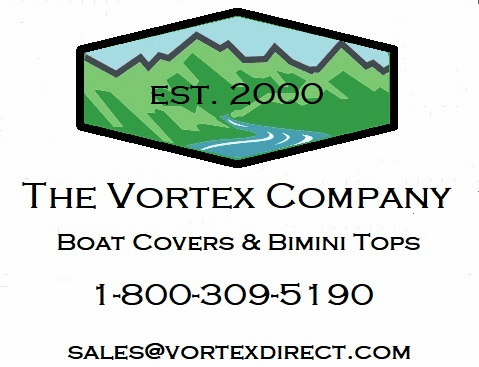 ( COMPLETE KIT: FRAME, FABRIC, & HARDWARE ) | VORTEX 4 BOW PONTOON/DECK BOAT BIMINI TOP 12' 85-90"
VORTEX 4 BOW PONTOON/DECK BOAT BIMINI TOP 12' 85-90"
Please notice 2 extra things we add in as part of the deal. 1. One is an option on mounting. 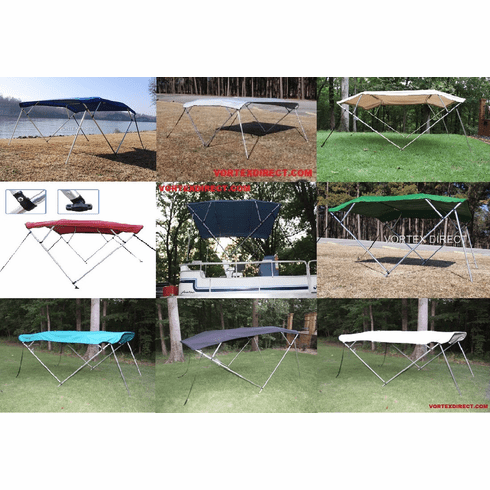 Many bimini tops come with 4 straps (2 for the front, and 2 for the rear).Ours come with that same thing, but we also give you support poles for the rear. This is normally a $40-$50 add on. The support poles add structural integrity to the top when it is up, given the inherent stronger nature of a metal pole vs a strap. This will also let you position the top in the 'radar' position, for easy deployment to full canopy. Or, if you prefer, use straps on front and back. That has it advantages also. We give you straps and poles for the rear, so you can use either as you need to. 2. The other option we throw in is the storage boot. This is normally a $20-$40 add on, but we include it as part of the deal. It is great for storage and keeps the top safe from the elements, as well as neat and organized. It is just a simple tube that zips around the top when you are not using it. Please see pictures. We strive to make size selection very easy. Please read the following. Then, determine the width of the top that you need. Measure from center to center across the rails where you want the bimini to mount. Vortex Bimini Tops normally mount directly to the top of the rails (pontoon boat) , although they will mount to just about any surface, as they also come with side mounts. We carry 3 main widths of tops. We carry widths of 79-84", 85-90", and 91-96". We generally recommend not to keep the Vortex bimin top 'up/extended' position, when not in use. Vortex Bimini tops are extremely waterproof, so leaving them extended gives them the opportunity to collect water, and possible damage the railing due to excess weight. We recommend, when not in use, to store the bimini covered either in the 'radar' position, or collapsed position. This ensures no water collection, and greatly reduces the chances of damage. Damage resulting from excess water collection would not be a warranty issue.